A fellow book blogger, Catherine of Gilmore Guide to Books, recommended a book by Laurie Frankel as one of her top reads of the year. I am reading that book now – This Is How It Always Is – and when I was researching it, I came across another one of Frankel’s books that caught my eye. That book showed up on audio sooner than the other one, so I picked it up first. Goodbye For Now is a novel set in Seattle. When it opens, Sam and Meredith are coworkers at an online dating company, Sam a programmer and Meredith in marketing. Sam develops an algorithm that identifies soul mates, which identifies Meredith as his perfect match. They start dating and fall in love, and all goes well until Sam is laid off and Meredith’s grandmother dies. Meredith is devastated, and desperate to make her feel better, Sam creates a program that mines all of Meredith’s emails from and video chats with her grandmother and creates a posthumous, digital version of her capable of interacting with Meredith on her computer. Meredith is horrified at first, but as soon as she finishes their “chat”, she wants to do it again. From this experiment, a company called RePose is born. The recently bereaved hire RePose to create digital alter egos of their loved ones, and then come to RePose’s office to interact with them. Word of this new service spreads quickly throughout Seattle, and Sam and Meredith find themselves very busy with their new venture. Goodbye For Now is a thought-provoking exploration of death, grieving and the ways in which survivors try to comfort themselves. There are many types of deaths in Goodbye For Now – sudden ones, deaths after long illnesses, deaths of children, spouses and parents, deaths of friends. There are even non-deaths, as families with loved ones suffering from Alzheimer’s sign up for RePose to be reminded of what they were like before the disease. Does RePose actually help the people left behind? Or does it keep them from moving on? What about the people who can talk more freely and honestly to the RePose version of their dead spouse than they could to the living one, while he was alive? And does RePose put pressure on the dying, who feel they need to create a positive, happy digital archive for their families so that they can have positive, happy conversations after they’ve died? Heavy stuff. And I haven’t even mentioned the deaths that actually happen in the book. I love Frankel’s writing and her sense of humor. She’s smart and thoughtful, which shows through in both Goodbye For Now and This Is How It Always Is. I wish we were friends IRL – she seems like a very cool person. (Laurie – friend me!) I also liked Sam and Meredith’s relationship, which was not plagued with conflict (unusual for a novel) but was built on love, attraction and respect. Overall, I liked Goodbye For Now, though it dragged in places and seemed to take a while to get through. There is a lot of detail and a lot of conversation, some of which could have been trimmed. But it’s a moving and sad book, and it’s one that will stay with me for a long time. If you can stomach the sadness and grieving, it’s a worthwhile investment. I listened to Goodbye For Now on audio. It was narrated by Kirby Heyborne, and even though it was written in third person, he was the perfect narrator for Sam, the main character. He sounded like a programmer – precise and focused, yet kind and passionate (and emotionally broken, when necessary). The audio was well done and I recommend it, though it too was a little long. Posted on December 14, 2017 by gayle. 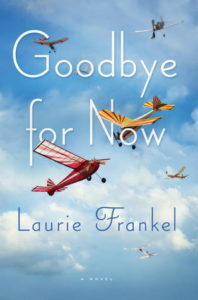 This entry was posted in Audiobooks, Fiction and tagged audiobook, goodbye for now, laurie frankel. Bookmark the permalink. I’m about 1/4 the way through the audio and am finding it a bit slow — I agree with you about it dragging at times. Tempted to move on, but I never like to put something down that I have started…. Did you end up finishing this? Sounds a bit too depressing for me, but the humor might help. I read Goidbye For Now a few years ago and it was so compelling. Great review here! I tried this one as well, but could not stay invested in it. Something about the premise creeped me so I gave up about halfway through. That aside, I am with you about Laurie Frankel! I mean, I live in Seattle as well- we should definitely be besties. When you guys become besties, be sure to let me join in. I finished this book last night. It was one of those books that when I finished it, I had to sit for several moments and think about what I really thought about it. I don’t regret reading it, even though I didn’t think I would like it when I read the summary from this review. I lost both my parents young (they were in their 40s, I was 17 and 24) and after finishing this book, I know my memories of them and stories from familiy and friends are “enough,” and I wouldn’t want or need RePose if it were possible. It took me a while to get through the book as well. Wow – thanks for sharing that comment. I think you’re right – memories and stories are enough. RePose is too hard!